Lord, just as You anointed Your disciples, I ask that You would anoint Wayne & Kathleen (sample) to go out in Your name and represent You in power. Confirm their witness with wonders and miracles. Bless those who hear their testimony and see their lives to receive Your truth. 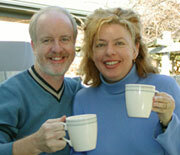 Fill Wayne & Kathleen (sample) with Your Holy Spirit and with power, that their lives might testify of Your glory.